As the lung cancer spreads by the lymphatic path, the lymphatic drainage of the lung is medically essential. The lymph from the lung is emptied by 2 sets of lymph vessels:. The peripheral lung tissue being located below the visceral pleura are drained by these vessels. The superficial (subpleural) plexus below the visceral pleura is created by them. The edges and margins of the fissures of lung are circulated by the vessels from plexus lung to reach the hilum where they drain into the bronchopulmonary (hilar) lymph nodes. These vessels drain the bronchial tree, pulmonary vessels, and connective tissue septa and create deep plexus. The vessels from deep plexus run along the bronchi and pulmonary vessels in the direction of the hilum of the lung going through pulmonary lymph nodes found inside the lung substance, and eventually drain into bronchopulmonary (hilar) lymph nodes. So both superficial and deep lymphatic plexuses drain into bronchopulmonary (hilar) lymph nodes. 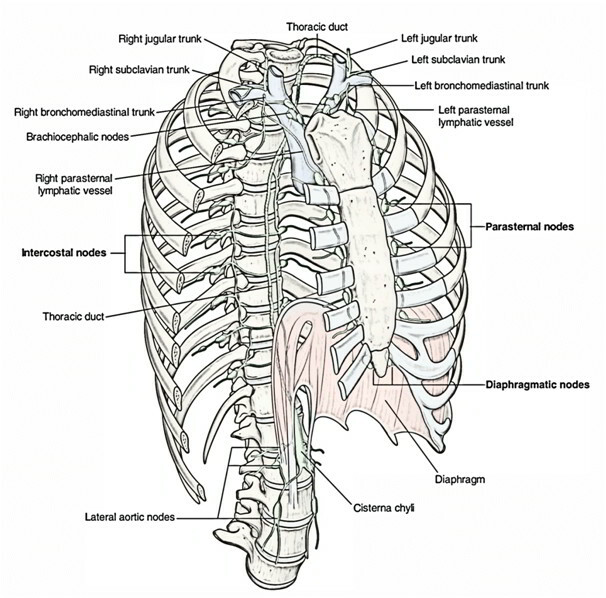 From hilar lymph nodes, the lymph is emptied into the superior and inferior tracheobronchial lymph nodes found superior andinferior to the bifurcation of the trachea, respectively. These nodes in turn drain into pre- and paratracheal lymph nodes, and left and right bronchomediastinal lymph trunk, which eventually drain into right lymphatic duct and thoracic duct on the left and right sides respectively. All the lymph from the lung is emptied into tracheobronchial lymph nodes (found at the hilum), which in turn drain into bronchomediastinal lymph nodes.